Danilo Türk, who is currently employed as a professor of International Law and Dean of Student Affairs at the Faculty of Law of the University of Ljubljana, is the new president-elect of Slovenia. 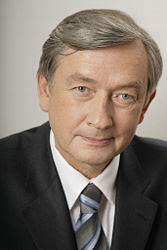 According to unofficial results, he is said to have won the run-off on 11 November 2007 with 70.8% of the votes thus beating the convervative Lojze Peterle. Definitely blog-worthy, I thought. Not every day that a prof becomes pres. I bet he's happy to swap the political aspect of the one setting for the other.